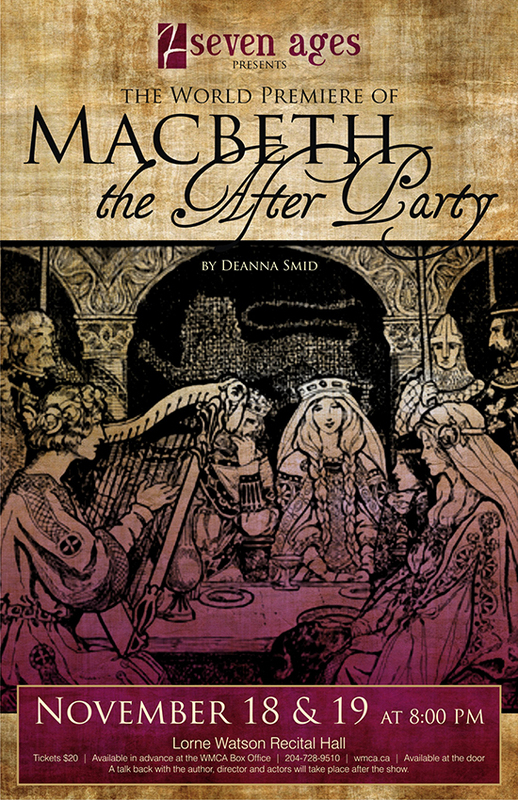 7 Ages Productions will perform Macbeth, the After Party on Friday, Nov. 18 and Saturday, Nov. 19 at the Lorne Watson Recital Hall. BRANDON, Man. — Brandon University (BU) professor Deanna Smid explores what happens after the curtain falls in her new play, which will debut this week. 7 Ages Productions on Friday, Nov. 18 and Saturday, Nov. 19 at BU’s Lorne Watson Recital Hall. 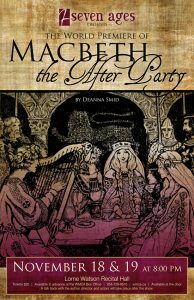 The comedy, set in Elizabethan England, goes behind the scenes to drop in on a group of cast and crew members as they gather to celebrate following a performance of William Shakespeare’s Macbeth. Each performance will begin at 8 p.m. Smid will be joined by actors from the production to chat with audience members following the production each evening. “When I read the script, I jumped at the chance to present it,” 7 Ages Productions Artistic Director George Buri said. Tickets for the play cost $20 and are available from the Western Manitoba Centennial Auditorium Box Office at wmca.ca/macbeth. They will also be available at the door. BU students can buy half-priced tickets from the Faculty of Arts Office in Room 100 at Clark Hall. Smid has extensively researched 16th- and 17th-century English literature. She was awarded a Postdoctoral Fellowship by the Social Sciences and Humanities Research Council of Canada for her project “Shakespeare’s Musical and Literary Therapy” in 2011 and was presented with the Montaigne Prize for best non-student paper by the Canadian Society for Renaissance Studies in 2012.